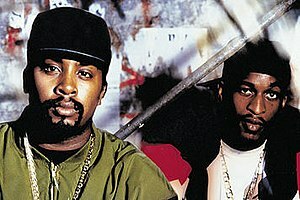 The duo recorded its debut album, Paid in Full, at Power Play Studios in New York. The album was named in part after the Paid in Full posse, a notorious New York collective of gangsters and rappers: including the original 50 Cent, Killer Ben, Kool G Rap and Freddie Foxxx. The Paid in Full posse are featured on the back cover of the album. In 1987, 4th & B'way Records issued the album. After the success of "Eric B. is President", the album climbed into the Top Ten on the US Billboard Top R&B/Hip-Hop Albums chart. Eric B. would later admit that the album was rushed. "The reason Paid In Full is so short is because we stood in the studio for damn-near a week. The whole album came together in a week. Listen to the lyrics on it and listen to how short they are. That's because Rakim wrote it right there and we'd been in the studio like for a whole forty-eight hours trying to get the album finished." Rakim agrees: "[I] used to write my rhymes in the studio and go right into the booth and read them. When I hear my first album today I hear myself reading my rhymes - but I'm my worst critic. That's what I hear, though - because that's what it was. I'd go into the studio, put the beat down, write the song in like an hour, and go into the booth and read it from the paper..." Marley Marl stated that his cousin MC Shan was an assistant engineer on some tracks, including the single "My Melody," though Eric B. denies this. MTV listed the album as the greatest in hip hop history: 'When Paid in Full was released in 1987, Eric B. and Rakim left a mushroom cloud over the hip-hop community. The album was captivating, profound, innovative and instantly influential. MCs like Run-DMC, Chuck D and KRS-One had been leaping on the mic shouting with energy and irreverence, but Rakim took a methodical approach to his microphone fiending. He had a slow flow, and every line was blunt, mesmeric. And Eric B. had an ear for picking out loops and samples drenched with soul and turned out to be a trailblazer for producers in the coming years.' The record has sold over a million copies and the Recording Industry Association of America (RIAA) certified it platinum in 1995. On the heels of the albums' success, the duo signed a deal with MCA. "There's nothing trendy about this impassive duo, no Steely Dan bites or bits of Afrodelic rhetoric here. Eric B. and Rakim are hip-hop formalists devoted to upholding the Seventies funk canon and advancing rap's original verbal mandate. Almost every track on their third album is built on poetic boasts and wicked J.B. samples, but dismissing Let the Rhythm Hit 'Em as some sort of conservative reaction – a gold-chain throwback – completely misses the point. Masters of their appointed tasks, rapper Rakim and Eric B. are also formal innovators. They both can riff and improvise like jazzmen, spinning endless variations on basic themes and playing off each other's moves with chilly intuition. The resulting music is as stark, complex and edgy as Rakim's stone-cold stare on the album cover." Rakim's subject matter often covered his own rapping skills and lyrical superiority over other rappers. AllMusic editor Steve Huey comments that "the majority of his lyrics concern his own skills and his Islamic faith." He also notes Rakim for his "complex internal rhymes, compounding, literate imagery, velvet-smooth flow, and unpredictable, off-the-beat rhythms." Pitchfork writer Jess Harvell described his rapping as "authoritative, burnished, and possessing an unflappable sense of rhythm". ^ SPIN - Google Books. Books.google.com. Retrieved 2013-07-05. ^ "Eric B. & Rakim - Biography, Albums, & Streaming Radio". AllMusic. Retrieved 25 June 2016. ^ "Eric B. & Rakim Biography". Sing365.com. Archived from the original on 2013-03-19. Retrieved 2013-07-05. ^ "10 Greatest Hip-Hop Duos of All-Time - Top 10 Hip-Hop Duos". Rap.about.com. 2013-06-23. Retrieved 2013-07-05. ^ a b c d e Martin A. Berrios (2008-02-29). "Class Of '88: Paid In Full". AllHipHop.com. Retrieved 2013-07-05. ^ "The Dopest Photo In Hip-Hop: The Paid in Full Posse". Inverse Culture. Retrieved 2017-07-29. ^ "Eric B. & Rakim - Awards". AllMusic. Retrieved 2013-07-05. ^ a b c "Rakim - Halftimeonline - Hip Hop Music & Culture". Halftimeonline. 2006-05-10. Retrieved 2013-07-05. ^ "The Greatest Hip-Hop Albums Of All Time". MTV.com. 2006-03-09. Archived from the original on 2013-07-19. Retrieved 2013-07-05. ^ "RIAA – Searchable Database: Eric B". Recording Industry Association of America. Archived from the original on December 19, 2015. Retrieved October 31, 2011. ^ "High Fidelity-WGTB: Chris Rock's Top 25 Hip Hop Albums". Highfidelitywgtb.blogspot.com. 2008-11-04. Retrieved 2013-07-05. ^ "Rolling Stone Music | Album Reviews". Rollingstone.com. Retrieved 2013-07-05. ^ "Large Professor Biography". Matador Records. 2002-10-08. Archived from the original on 2013-07-23. Retrieved 2013-07-05. ^ "GameSpot Forums - Off the Books: Anything and Everything Hip-Hop - AHH Review: Class of '88 - Paid in Full". Gamespot.com. 2008-03-05. Archived from the original on 2012-07-30. Retrieved 2013-07-05. ^ "The Rock and Roll Hall of Fame Announces 2012 Nominees for Induction. Eric B is represented by Louis Gregory, pka Uncle Louie, who is the CEO of ULMG". ULMG.org. 2011-09-27. Retrieved 2012-04-03. ^ "Eric B. & Rakim to Reunite for 2017 Tour, Album Reissues,". Rolling Stone. 2016-10-22. Retrieved 2016-10-23. ^ "Watch Eric B. & Rakim Play First Show in Over 20 Years | Pitchfork". pitchfork.com. Retrieved 29 November 2017. ^ "Eric B. & Rakim Announce Tour | Pitchfork". pitchfork.com. Retrieved 6 March 2018. ^ a b Freedom duLac, Josh. (October 2, 2006). "A Stop-and-Go Hip-Hop Show". The Washington Post. Accessed September 5, 2008. ^ a b Ratliff, Ben. Review: Paid in Full. The New York Times. Retrieved on 2009-10-19. ^ Huey, Steve. "allmusic Rakim > Biography". AllMusic. Accessed September 5, 2008. ^ Light, Alan (November 13, 2006). "The All-TIME 100 Albums". Time magazine. Accessed September 29, 2008. ^ a b "MTV.com: The Greatest Hip-Hop Albums Of All Time Archived 2013-07-19 at the Wayback Machine". MTV (2005). Accessed July 15, 2008. ^ Jarenwattananon, Patrick (2009-11-23). "The Microphone Fiend On John Coltrane". NPR. Retrieved 2011-10-06. ^ a b Harvell, Jess. "Eric B & Rakim: Paid in Full / Follow the Leader". Pitchfork. Archived from the original on December 25, 2008. Retrieved June 18, 2017. ^ Huey, Steve. "Rakim". AllMusic. Retrieved 2012-03-30. ^ Huey, Steve. Review: Paid in Full. AllMusic. Retrieved on 2009-10-19. ^ Christgau, Robert. "Consumer Guide: Paid in Full". The Village Voice: September 29, 1987. Archived from the original on 2009-10-19. Wikimedia Commons has media related to Eric B. & Rakim.